- Seven-day snowfall totals as much as 1.5 metres (5 feet) in the Alps. - Scottish ski areas have more runs open this week than they have had open all season. - Swiss resorts still posting the world's deepest snow bases, with two at 6 metres plus. - Avalanche danger at level 3 'considerable' above 2000m in parts of Eastern Alps. Last week ended with some of the heaviest snowfalls for several months across most of the alps (and down into the Dolomites) with some areas reporting up to 50cm in 24 hours. That was the conclusion, in most area, of a snowy fortnight that led to rising snow depths, on upper runs at least, across Europe. Since the weekend though things have turned much quieter in terms of snowfall, with just the occasional, lighter snow shower, and the trend towards warmer temperatures. We are of course entering late March and the start of spring (the astronomical version) so that's perfectly normal with freeze-thaw conditions for the snowpack. The avalanche danger is mostly level 2, moderate, across much of Europe, but in the Eastern Alps (Austria, parts of Switzerland and Italy), it's at level 3, considerable, meaning off-piste skiers and boarders could set off slides. Elsewhere in Europe, it's clear but fairly cold in the Pyrenees and Eastern Europe with snowy conditions up in Scotland and Scandinavia. Indeed Scotland is seeing some of its best conditions of the season so far. Across the Atlantic, it's a similar story with big snowfalls last week largely ending by the weekend (the exception being Alaska where it just keeps dumping) and there have been the first reports of ski areas in southern states like Arizona and New Mexico ending their seasons as temperatures rise. Equally, though there are more reports of extended seasons as snow bases at most major resorts are well up on the average. Generally clear and sunny for the next week, for most of The Alps, with varying temperatures. There are hints of a cold end to the month in some forecast models but we'll have more clarity next week. 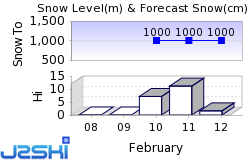 Last week was a snowy one in Austria, building up to the heaviest snowfalls, as forecast, on Thursday/Friday. But it seemed that every day over the past 7 days, some resort, somewhere in Austria posted a 20cm+ 24 hour new accumulation. 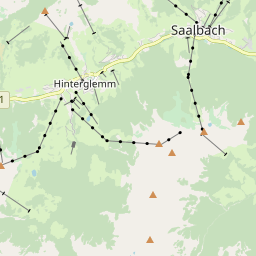 Most recently that included Saalbach and the Zillertal Arena both posting 30cm snowfalls on Monday. Since then though things have 'calmed down' a good deal and the sun has been out for blue sky skiing on fresh snow. The deepest bases are on the country's glaciers, almost all of which have snow lying at least 4 metres deep which should leave them in a strong position for the spring. Top of the table is the Dachstein glacier with a 5.9-metre base, the third deepest in the world at present. The fresh snow in the French Alps at the end of last week caused upper slope snow depths to grow by as much as 50cm, compared to this time last week, whilst lower slopes where there was less snow and sometimes rain at low elevation, saw depths diminished. On high slopes, a number of resorts have gone past the 3.3 metres (11 feet) depth mark when last week no French resort was reporting deeper than 295cm. Les Arcs and La Rosiere are up there on 3.3 metres. Then at the bottom, the lower slope base depth quoted by Chamonix has dropped to zero. Le Grand Bornand reports 20cm on low slopes, Serre Chevalier 26cm, but for most resorts, there's still 60cm plus and at many of the altitude resorts more than a metre, so the final month of the main season is looking good. Italian ski slopes are warming up as we move into the weekend with some areas likely to hit +15C in resort and as much as +10C on higher slopes by Friday, which will of course impact on snow conditions. Most Italian areas do have a fairly good cover (the deepest snow is reported to be lying 4 metres thick on the Presena Glacier), but some have only 20-30cm on lower slopes, so they may have problems maintaining cover down near resort for the final weeks of the season. All in all, it is classic spring skiing now with the best conditions in the morning. There's a possibility of lower temperatures and some light snowfall towards the middle of next week but that's not certain at present. Swiss resorts continue to post the world's most impressive base depths with Andermatt and Engelberg leading the way with 6m/20 feet+ bases. But behind these huge numbers, most other Swiss areas are looking good too, most with 2-4 metres upper slope base depths and the majority with plenty to see them through the remainder of the season on lower slopes too. Most of the country's resorts did well from the snowfall at the end of last week, posting 50-100cm accumulations of fresh snow on upper runs. It was still snowing at the start of this week with Laax posting 20cm and Arosa 35cm of fresh snowfall on Sunday/Monday. There's been plenty more fresh snow in Scandinavia over the past week with Finland in the far north now in its best shape of the season (which has been a challenging one for reliable snow cover) and now every ski area is pretty well fully open. There's been a lot of fresh snowfall in Norway and Sweden too leaving more-or-less every area in the region fully open with fresh snow and rapidly increasing daylight hours. No real fresh snow this week in the Pyrenees but temperatures have been staying low in Andorra so there's not been any major loss of the snow-pack either. Bases are fairly good across the region and resort operators are pushing snow down on to lower slopes where the snow has now all gone to ensure top-to-bottom skiing is still possible. There's no snowfall in the forecast but plenty of blue sky. Conditions are arguably the best they have been all season in Scotland after three weeks of mostly cold weather and frequent snow showers. This week the five Highland centres have reached a tipping point with depths (up to 1.3 metres now on upper slopes) adequate to re-open runs closed since the February 'record warm temperatures' thaw. About 70 trails are open across the five areas, the most this season, with Glencoe fully open, Cairngorm with more than 20 runs skiable and the other three centres about half open. Temperatures are rising again and there have been closures due to strong winds but generally, conditions are good. Eastern Europe covers a large area of course and the western side of the east – Slovakia and the Czech Republic, benefited from some of the same snow that hit the Eastern Alps last week, with some healthy dumps reported at resorts like Jasna. Further East there was less fresh snow in Bulgaria, just a dusting in fact, with rain at lower elevations, but temperatures have stayed lower here on the mountains at least than many other parts of Europe so Spring snow conditions are pretty good. It is getting warmer though and double-digit temps are expected top to bottom from the weekend on. Warm in the west and full on winter in the East is the current picture in Canada where it is snowing hard in Quebec, but reaching double digits above freezing at resorts like Whistler on the BC Coast. 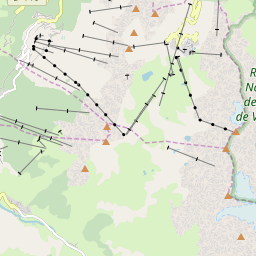 So it looks like Tremblant's 5.4-metre base, still, the country's deepest may grow still more. Things are now cooling down a little out west and it looks like snow should start falling in Alberta and BC, on higher slopes at least, from, the weekend. The heavy snowfall in the western US has largely eased off for the time being and it's actually quite warm now with a thaw underway. This has lead to a few resorts in more marginal snowfall states like Arizona to call it a day on the 18-19 season and close until next winter. To the north of the country though, up in Alaska, it's a different picture with Alyeska ski area reporting more than 1.8 metres (six feet) of snowfall there over the past week. There does look to be some more heavy snow on the way but for a change its eastern areas that look like they're going to be dumped on with as much as 40cm (16 inches) of snowfall expected in Vermont and New York state by Saturday. Ski Hire Shops in Saalbach Hinterglemm, Mayrhofen, Hintertux, Finkenberg, Tux - Finkenberg and Hippach.